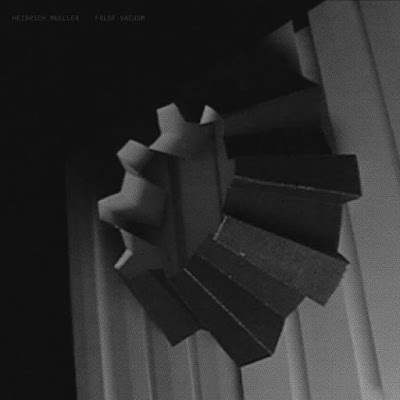 WeMe Records have compiled a very nice collection of Heinrich Mueller remixes/remodels. The 2xLP, False Vacuum, is now available for pre-order at this link. Initially there are 200 blue vinyl exclusive to the WeMe webshop and later there will be 500 on black vinyl for Clone Distribution (you can pre-order it here). Keeping up with this aspect of Mueller's work has been one of the most enjoyable parts of doing DRL. There are so many real gems hidden away on obscure labels in very limited editions and it's great that some of these are going to get a bit more exposure again.You can sample all of the tracks at the pre-order link. This project has been in the pipeline for sometime and I helped select the tracks and wrote the promo text for it (below). Glad to see it is almost with us! This is the first time any of Heinrich Mueller's highly sought after remodels/reworks have been compiled together. Many have been previously available only on limited releases and have patiently been awaiting discovery by a wider audience. For those who don't know, since the mid '90s Heinrich Mueller (Dreciya/Dopplereffekt) has been quietly amassing an impressive catalogue of these unique productions (currently about 40+) which completely transforms the other artist's track to his own exacting specifications. To the effect that there might be very little or nothing at all left of the original production. These 9 specially selected examples embrace all facets of his approach. First up is the ultra smooth and minimal 'Fadin' Away' by The Hacker from 2000, probably one of his most sublime and timeless creations. Then jump forward to 2011 when he serves up an infectious and sparse slice of robot funk for Albert van Abbe's 'NCS_0009121010'. By the time of Alek Stark's 'Halo 6' (2014) he's still got the dance-floor on his mind, but it's located on an alien or perhaps underwater world in some dimension parallel to our own. In 2009 he works for the first time with fellow Drexciyan traveller DJ Stingray and delivers the hard edged but still quite delicate 'Drone FX'. Jump to 2005 and he conjures the playfully disjointed 'P.O.M. (Time Dilation Mix 2)' for Duplex. In 2000, when he had a close relationship to the label, International DeeJay Gigolo, who were releasing Dopplereffekt and the first fruits of Der Zyklus, they commissioned him to make a series of groundbreaking mixes. On one of which he got to mesh his own futuristic vision with that of Stanley Kubrick on 'Dave' by Station Rose. The other closes this collection and is another of his most accessible works, with the best bassline, 'What Use' by the legendary '70s San Francisco band, Tuxedomoon. In 2011 he also produced a darkly atmospheric and relentlessly mechanical interpretation of DJ Stingray's 'The Sadist'. In 2003, another of his best production efforts, again aimed off-squarely at yet another form of mutant dance floor, came out of a total revamp of an untitled track by The Advent. Fittingly this was originally included on Recreations, an album where artists were invited to do what Heinrich Mueller does best.